1. At What Age Should My Child be Able to Read? Children begin to read at many different ages. Some Boys and Girls start learning their alphabets and sounding out words by age three or even before… for other children the process of reading doesn’t happen until they are four or five. Generally, children should be able to recognise their letters and sounds by the time they start school. If they seem to have trouble distinguishing letters and sounds, a specialist may need to intervene to ensure the youngster doesn’t have a physical or learning disability. 2. How Can I My Child Interested in Reading? One of the best ways to get a young person interested in reading is to make sure you read both to him and for your own pleasure. 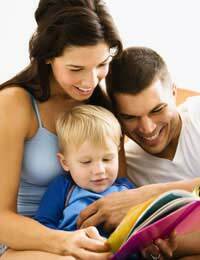 From the time they are born, kids typically find pleasure in being read to – it provides a closeness between a parent (or grandparent) and child that youngsters innately crave. As they get older, reading with a loved one becomes more of an opportunity to learn about the world around them as well as a vehicle for dealing with their own concerns, emotions, and ideas. 3. My Child is Mixing up Letters… Is She Dyslexic? Before you jump to conclusions, it’s important to be aware that many children confuse “b” and “d” or “p”, “q”, and “g” when they are first learning to read. Therefore, if your son, daughter, or student is mixing up those letters or their corresponding sounds, it doesn’t mean he or she is dyslexic. That being said, if there are other indicators of dyslexia, such as the inability to connect sounds with letters or confusing the order of letters in a word, your child may indeed have a learning disorder like dyslexia. If that’s the case, take heart – with time, patience, and special instructional methods, most children suffering from a learning disorder can learn to read. 4. I’m Not a Keen Reader… Could That Affect my Child’s Ability to Read? Children tend to emulate their parents and/or guardians. Consequently, if you want your child to read, you would be wise to pick up a book, magazine or newspaper yourself on a regular basis. Many adults were not taught how to enjoy reading, so why not take this opportunity to retrain yourself? You may just find out that by reading for the benefit of your youngster, you’re actually doing yourself a huge service! 5. I’m Not a Teacher. Am I Unqualified to Teach my Child to Read? Absolutely not! While you may need to seek out advice if your child is having a special problem learning to read, you don’t need any formal training to help him or her learn the alphabet, connect sounds with letters, or even sound out (or recognise) words. If your son or daughter is already in school, why not ask his or her teacher(s) for suggestions on how to help the process along at home? That way, he or she will have the benefit of twice as many opportunities to learn to read. 6. Could My Mistakes Hinder my Child's Learning Progress? Chances are that you won’t hurt your child if you make some mistakes along the road to his or her literacy. Just as every person is unique, so is his or her learning style. And errors are just part of the process. In fact, one of the best things you can do as a parent or instructor is to openly admit your gaffes, which will show your child that even adults make mistakes. That can be an important lesson and will often alleviate a hesitant young person’s anxiety about being “wrong”. 7. How Can I Make Learning to Read Exciting? One fun way to make reading more exciting is to talk about your child’s favourite books in depth. For instance, after you read a story, discuss what the characters did, what they learned, why they chose certain actions and not others, et cetera. You can also make up short stories using the characters. Ask your child, “What do you think happened next?” Often, the youngster is happy to invent a continuation of a tale, and if he or she is learning to read, you might want to write the extended version down so you can read it together later.